You have put up with the moods and the tempers for a while and you have learnt not to ask certain questions at certain times. You have passed it off as just part of growing up, pressure at school, boyfriend trouble. A bit down in the dumps but it will surely pass. 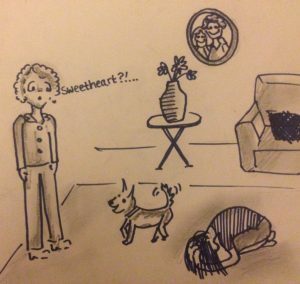 But you caught a look this morning. A look of sadness and helplessness. And then the thought suddenly strikes you: What if this is NOT normal? What if this isn’t just teenage moody blues? What if my 15 year old daughter is suffering with actual depression? It seems that she is only just hanging together some mornings, she looks tense and rarely smiles. Lately she isn’t seeing much of her friends and all enquiries from you are met with hostility or indifference. Here is the thing: It is perfectly normal for you to feel worried about her and to wonder if there is something really wrong. It is actually impossible to be an unprejudiced observer of your own child’s ups and downs on the emotional roller coaster of adolescence and, lest we have forgotten, the journey from dependent child to independent adult is rarely smooth. Use them to gauge where your daughter is at. Consider how long the symptoms have been present, how severe they are, and how different your child is compared to a month ago and six months ago. While some “growing pains” are to be expected as teenagers grapple with the challenges of growing up, dramatic and long-lasting changes in personality, mood or behaviour are red flags of a deeper problem. You may know other adults, who are depressed and it is important to understand the difference between teenage and adult depression. In young people irritability is more prevalent than sadness. Sudden anger outbursts, hostility and frustrated moods is more often seen than grief and sadness. Like the ‘nervous tummies’ of younger children, depressed teenagers often have unexplainable aches and pains. Isolation (watch out for the ubiquitous screens that make it very easy to hide in full view of everybody!) or a change in who they socialise with is another red flag. Sudden extreme sensitivity to criticism. 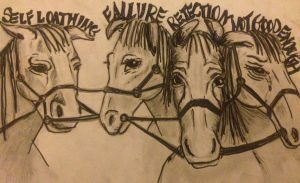 No one likes to be criticised but when the four horses of depression: Self Loathing, Not Good Enough, Failure and Rejection are harnessed, it takes very little to tip the balance. School problems such as attendance, behaviour or a drop in grades may occur as well as attempts to self medicate by using alcohol or drugs and other reckless or violent behaviour. If you decide to see your GP and you are offered anti-depressants make sure you research them thoroughly as many anti-depressants have serious side effects such as suicide when used by children and teenagers. If you are interested in a drug free solution to your child’s depression take a look at how I work with young people and read their stories too. Have you experienced this uncertainty? Have I missed out some of the sure signs of depression in adolescence? We all have wisdom and insights to share and your story might help another parent or young person get the right help at the right time. Join the private, members-only, peer-support community on facebook and get advice, insights and ideas about parenting teenagers. Would you like to receive more information like this to help your family be happy again? Pop your details below to receive my blogs straight into your inbox. I'll also let you know about opportunities to work with me from time to time.